Most performance issues with a laptop are not with the hardware but with the software installed on the computer. Viruses, malware, poorly written programs and poor maintenance practices are just a few things that cause Windows to slow down or even become unresponsive sometimes. When virus scans or registry cleaners cannot help, it is time to start over and restore the laptop to its factory default settings. 1). Connect an external hard drive or USB flash port to the laptop. Back up important data and document files because the recovery utility deletes any user created files when restoring the laptop. 2). Power off the Toshiba laptop and connect the AC power adapter. Press the "0" (zero) key and hold it while pressing the "Power" button on the Toshiba laptop. Wait for the "Toshiba HDD Recovery Utility" menu screen to appear on the display. 3). Press the "1" key to select the "Restore Original Factory Image (Recommended)" option. Click "Yes" when confirmation message appears on the screen. 4). Wait for the recovery utility to reformat the primary partition on the Toshiba laptop and copy needed system files. Depending upon the model of your Toshiba laptop and the version of Windows installed, the recovery process may take up to 15 minutes. Press any key on the keyboard to restart the laptop when prompted by the recovery utility. 5). Boot the laptop in to Windows normally. Follow the on-screen prompts to personalize the Windows installation and activate it if prompted. 6). Connect the external storage device to the laptop. Copy the backed up files from the drive to the laptop. 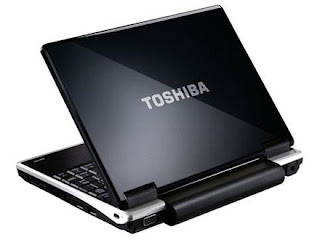 Install additional programs on the Toshiba laptop as needed. Kool site keep it up. May be you should help me to install WOL software. I can run WOL software in windows 7, but having problem installing in Windows Embedded Posready 7 any clue will be highly appreciate. I changed Regedit current version to Microsoft Windows XP but it didn't work.